Before you print the menu, you should save your work. Choose Save from the Project menu to save the document with the current name. If you have not already configured your printer setup in PageStream you should do so now. When you have selected a printer driver with Print Setup from the File menu, you are ready to print your document. 1. Choose Print from the File menu. 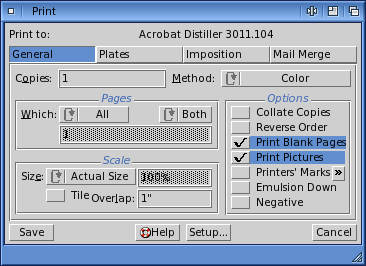 The Print dialog box will appear. 2. Choose the print options. PageStream defaults to printing all the pages in a document. If this is what you want, you do not need to change any options in the dialog box. If you want to print the current page only, choose Page from the Pages pop-up menu. If you want to print a specific page, or a range of pages, choose Range from the Pages pop-up menu and then enter the page numbers into the text box below it; separate ranges with dashes. i.e., 2 for page 2 only, or 2-4 for pages 2 to 4. Click on Print to print the document. A print status dialog box will appear to keep you informed of the progress of the print job. If you have any problems while printing, check your printer connection and verify that you have correctly set up your printer. If you cannot resolve your problem, refer to the Print Setup section to ensure you have correctly chosen your printer driver, and to the Troubleshooting section if it is necessary. Congratulations! You have finished the lesson!